NEW YORK (CNS) — Catholics have a responsibility to look past the noisy rhetoric of the current debate on immigration and answer the “cry of the poor” by engaging with individuals facing deportation. That was the focus of a National Migration Week discussion Jan. 11 at the Church of St. Francis Assisi in New York examining the plight of individuals affected by President Donald Trump’s Jan. 25, 2017, executive order on deportation. Presenters discussed practical actions to extend Christian charity and seek justice. National Migration Week began Jan. 7 and ends with the World Day of Migrants and Refugees Jan. 14. 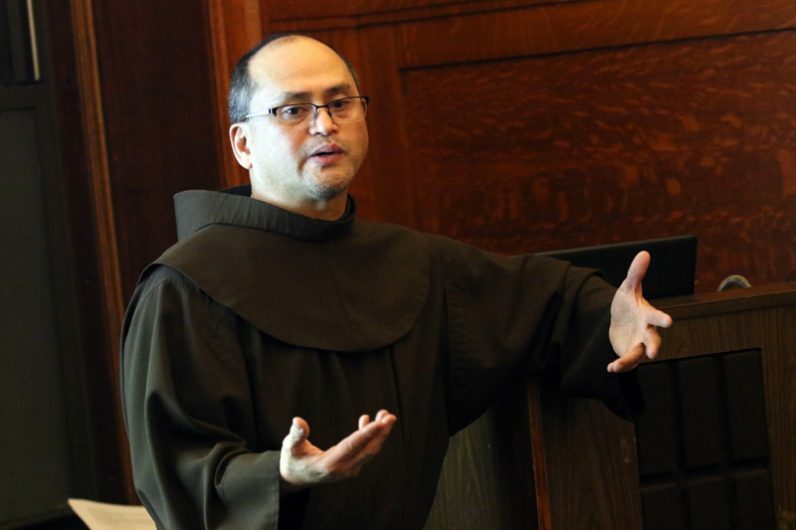 Father Jagudilla, director of the Migrant Center at St. Francis of Assisi since 2012, detailed routes to legal immigration and said there are more than 12 million people who face removal from the United States because of an irregular or precarious immigration status. This number is made up of more than 11.4 million people in the country without legal permission and about 700,000 “Dreamers,” those currently protected by the Deferred Action for Childhood Arrivals program. Also included are 325,000 people from 13 countries whose Temporary Protected Status has been terminated, and 60,000 unaccompanied minors who fled Central America in 2014. Father Jagudilla said those individuals make up 3 percent of the U.S. population and the reasons cited in the order for their removal are vaguely worded and open to broad interpretation. The Catholic Church shies away from using provocative words to describe immigrants because such words are “an assault and insult to their dignity” and contradict “what we believe about the value of the human person,” Father Jagudilla said. Father Jagudilla said the center has given legal, advocacy and education services to more than 3,000 people since it was reinvigorated in 2012. Legal assistance is provided by two contract attorneys and trained volunteers. The center’s education programs include forums on immigrant rights, labor unions and human rights. “Through our campaigns, we cautiously engage the undocumented. They trust us because we are from the church. It is a re-victimization if they turn to the Catholic Church and there is nothing for them,” Father Jagudilla said. Migrant Center volunteers visit people held in a U.S. Immigration and Customs Enforcement contract detention facility in Elizabeth, New Jersey. 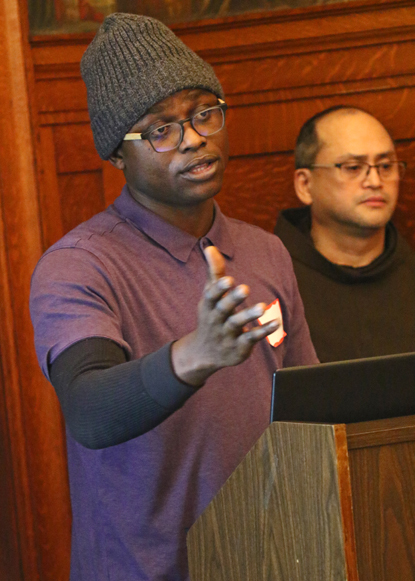 Lawrence Omojola, the Migrant Center’s volunteer liaison officer to the detainees, described the twice-monthly visits as a corporal work of mercy and an expression of hope. “For some people detained at the airport on their first trip to the United States, we are the first people they interact with from outside the immigration system. We are representatives from the outside world and a reminder that there is a community that remembers them,” he said. Omojola said most of the detainees at the Elizabeth facility have no prior convictions and some are held for more than one year. “They need someone to listen to them. We don’t give advice. We reach out and hear their stories,” he said. Omojola conducts an orientation for volunteer visitors from the Migrant Center. They join volunteers from Jesuit-run St. Francis Xavier Parish in Manhattan on visits organized by First Friends, a local organization that works on behalf of detained immigrants and asylum seekers. Father Jagudilla said 380,000 to 420,000 people are detained in the U.S. each year by immigration authorities. They are held in 47 private, for-profit detention centers and more than 200 county jails. Jennifer Engelhart became a volunteer visitor with the Migrant Center through the young adult group at St. Francis of Assisi. “It was really powerful to look into the face of someone who was trying his best to remain hopeful and positive in a tough and uncertain situation,” she said of a recent visit. The 37-year-old construction worker she visited was brought from Mexico as a child. His car was pulled over in a traffic stop 15 months ago and he was detained when he could not produce legal documentation. “You hear about this on the news, but it’s not a reality until you speak with someone who tells you his story,” she said. Father Jagudilla gave urgency to his call for a compassionate response to immigrants without papers when he said a colleague in the immigration movement was detained earlier in the day. Ravi Ragbir, executive director of the New Sanctuary Coalition, a network of faith and community groups that advocates for immigrants, was arrested Jan. 11 when he appeared for a routine check-in appointment with immigration authorities at the Federal Building in New York. Ragbir was convicted of a nonviolent felony in 2001 and has fought a deportation order for more than a decade. His arrest sparked street demonstrations in Manhattan.